What does a fashion aficionado hailing from New York do when she turns of age? Travel the world and write about fashion. From New York to Bangkok, from Onyxmilk (USA) to Adorned Magazine (UK), Lindsay Christinee has traveled and written about it all since 2009. Patent leather shoes are identified by their hard mirror-like exterior. Soft leather is acceptable for most occasions, but patent leather possesses an entirely different set of fashion etiquette. It can be eye-catching; but if worn incorrectly, it can look cheap. Know when to wear patent leather and what styles to choose to gracefully walk the fine line of appropriate dress. Know shoes styles that look appropriate in patent leather. For men, patent leather shoes are generally a black or brown dress shoe, making it nearly impossible to make a fashion faux pas when it comes to style. Women need to pay more attention to styles. Avoid over-the-knee boots or 5-inch stiletto pumps in patent leather, as these can evoke a working-woman vibe. Instead, choose Mary Janes, ballet flats, loafers and ankle boots in an appropriate heel height of 4 inches and under. Wear colors depending on the season. Nudes, whites, and pale and bold colors work better in spring and summer. Although some fashion designers will argue white can be worn in winter, it is considered a faux pas by others and should be worn with caution. Black, brown, jewel and autumnal hues look best when worn in winter. The exception is black looks appropriate for formal or professional occasions regardless of the season. Decipher when it's appropriate to wear your patent leather shoes. Both sexes should stick with classic styles when wearing patent leather in the office. 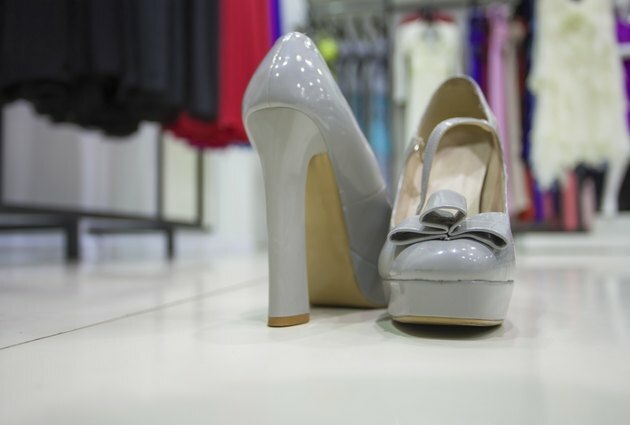 Ladies, pair a dress or suit with a simple pump or flat in black or dark hues. Men, a well-shined black patent leather shoe is de rigueur for tuxedos or dress suits. However, this style also looks appropriate as everyday office wear; yet, it might appear too dressy if paired with casual attire. Ladies, accessorize your patent leather shoes with opaque hosiery in winter. Use your shiny boots or pumps to add dimension to a monochromatic outfit. Embossed leathers contrast well with dresses and skirts in thicker fabrics -- tweeds, nubby wools and heavy knits -- in winter. For men, patent leather shoes are standard shoes for black-tie events and are to be worn with a tuxedo, and black wool or silk socks. Corporette: Are Patent Leather Shoes an Option for a Conservative Office? Today.com: White shoes: Faux Pas or No? In What Month Is It Appropriate for Women to Start to Wear Open Toe Shoes?